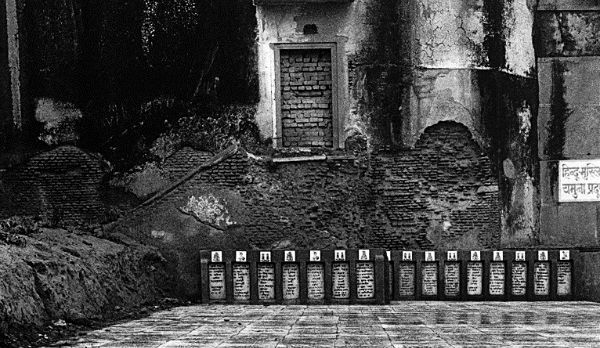 In his latest exhibition, Saibal Das explores some of the countrya��s most significant pilgrimage sites, religious practices and ideologies. The photographer is known for the empathy that pervades his work, and it is this human connect that also shines through in this series of black and white prints. Before the Birth of Time forms part of Tasveera��s ninth season of exhibitions, in partnership with Vacheron Constantin. Inspired by his photographer father, popularly known as a�?Kanu Daa��, Dasa��s passion for the medium dates back to his childhood. Building on his early training as a photojournalist, the exhibition is the culmination of nearly three years of work, and has allowed Das to create a narrative from individual interactions with the almighty. a�?The Indian philosophy of living and accepting the smallest pleasures of life is what Before the Birth of Time represents. This is the story I wanted the world to see through my exhibition,a�? says the photographer. Taken in Nabadwip, West Bengal, Royal Lady is the story of a woman of the Manipur royal family, who has dedicated her life to Vaisnavism. Other-worldly yet peaceful, her gaze doesna��t quite seem to meet that of the viewer, but her presence in the shot is all-encompassing. In Remembering Stonea��, Das captures the Hindu belief of sculpting name plates for departed loved ones, while Worshipping Sun God narrates the story of those who celebrate Chhath Puja. a�?The concept of spiritual practice never appealed to me but I admire the activities people participate in by submitting themselves to the Almighty,a�? Das signs off. Until May 15 at Tasveer, Kasturba Cross Road.